As a young Application Engineer, I was focused on knowing the answer to definite questions. Now I look at data differently – I look for trends. Around 10 years ago testing was done to determine the effects of a range of fluxes with a range of solder alloys, on many different surface finishes. At the time, the data was commonly used to determine which flux is best in any given situation. A customer would call in and, after finding out what alloy they wanted to use and what surfaces they were soldering, I could say with great certainty: “Flux X is the very best for your application”. The way I view that type of data is very different now. Instead of using it on a case-by-case basis, I use it to see a larger trend. 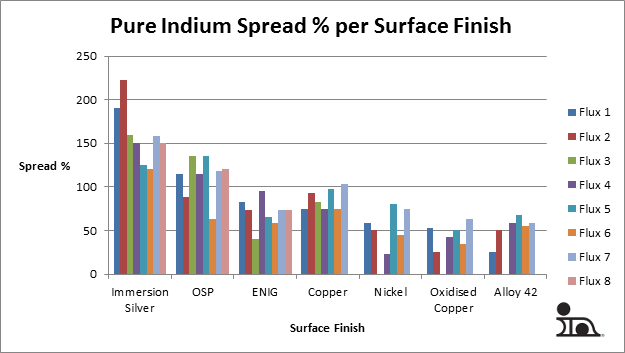 After looking at the data for Spread % of pure indium on various surfaces, I no longer only point out that Flux #4 will perform very well when soldering ENIG parts with indium. Now I notice that Flux #3 won’t be a good alternative for applications that may use Nickel, Oxidized Copper, or Alloy 42 surface finishes, it would be best to promote a more well-rounded flux – perhaps Flux #7. This would be a better choice in case a customer wishes to change their surface finish at some point in the future. It also stands out that maybe customers using ENIG could switch to Immersion Silver if it saves money and otherwise fits their application. This is just a dated example, using old data. The point stands though: we can use data trends to give larger answers to our customer’s questions. If you’re really good, you can answer the next question before it is asked.